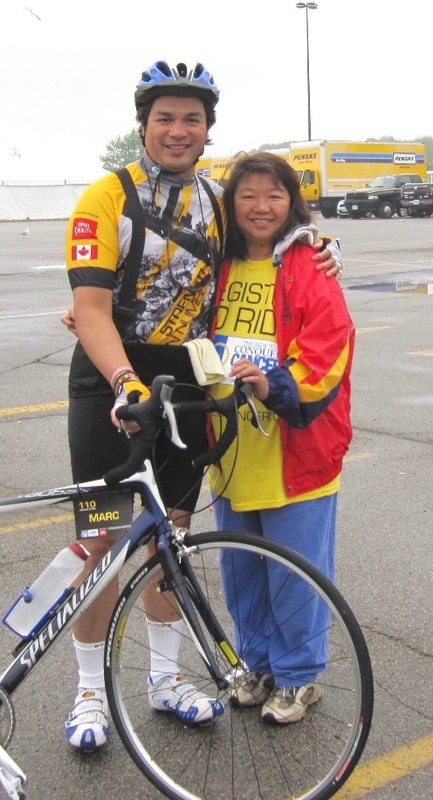 This coming weekend, June 12-13, 2010 will be my third and final year to do the Toronto to Niagara Falls bike trek for Princess Margaret Hospital Foundation. My wife and I wish to thank you, all our supporters, for the past three years in a row that I participated in this fundraising for cancer research. Thank you to all who had been with us since the start and by being a repeat sponsor. I’m especially grateful to everyone who supported me on my final year, for your faith and belief in me and the cause. A few days before the ride: I hurt my back Monday morning doing a simple backyard chore. This chronic back problem has been with me for many years. Just my luck, only 4 days before the ride! Since I have a degenerative disc on my spine, a simple chore like what I did or a wrong turn or twist can trigger the pain. I will have these attacks ever so often. Don’t know if back surgery will cure this but for now, I don’t want to take a chance. Whenever these attacks happen, I am usually on my back and takes about 5 days to recover! I was hoping to get some more last few days of riding time before the weekend event but now, I’ll have to take it easy. Update: I still managed to do the ride. The back pain was still bad, but bearable. I was stiff the whole time but didn’t want to end my last effort on my back. The excitement of the ride helped me get my mind off the pain and was especially true at the Finish Line in Niagara Falls. This was also the first time my mom made it to the ride event and see me finish. She had been ill the previous years. It was good to see her there!